The South Florida paddling community has lost a devoted and inspirational leader with the passing of Keith Wasserman. The news of Keith’s passing in February 2017 has just been conveyed to his many friends and fellow backcountry explorers. We will deeply miss Keith’s quiet devotion to the beautiful South Florida wilderness areas that provide a welcome respite from the frenzy and noise of daily life in a major metropolitan area. Using his canoe and his camera, Keith revealed and shared many breathtakingly beautiful pristine pathways within our cherished parks. Keith also spent countless hours sharing his knowledge and expertise as the founder of the online community here GladesGoDeep.ning.com/Everglades Exploration Network, a site that has created a true family of those committed to seeking out adventure, preserving nature and protecting wildlife for future generations to treasure and explore. In honor of Keith and his passion for nature and the wilderness, GladesGoDeep/Everglades Exploration Network will be maintained through the support of the South Florida National Parks Trust which has committed to fund all costs for the continuation of the website. We salute our friend, explorer and mentor Keith Wasserman and send our condolences to his family and friends. 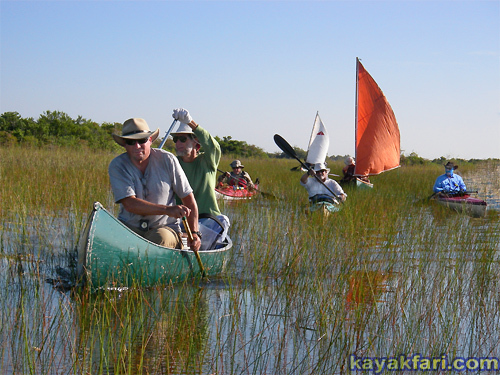 I did not know Keith but through his websites I gained the information needed to paddle and explore the Everglades. I am eternally grateful for his love of nature and his willingness to share. April 14th (next weekend) is the 50th Anniversary of the founding of Biscayne National Park. The South Florida Bushpaddlers Association will be sponsoring a couple of tables in memory of Keith and will be picking up 50% of the cost of all users of his sites (and their +1), if they would like to go. It would be good to sit by the bay, drink adult beverages and remember Keith! Hope you can make it! Just contact Jessica or Don @ 305.665.4769 and they can coordinate the tickets net of the match! RIP. May your spirit ever explore the less known waters, airs and lands of our home and beyond. Thanks to Keith and the efforts of him and others on this blog, I’ve come to a better understanding of the Glades culture; and spread the word to others, so his words keep bringing new friends to the backcountry. Lot's of memories come back & seeing the pix again just reminds me of the impact that he had on my life as a bushpaddler! As I like to joke, years ago when I started the Bushpaddlers, I led idiots into the wild. After I met Terry and Keith... which wouldn't have been possible without this site,... I follow idiots into the wilder. Your lead picture says it all, the first Invitational. Terry & Keith leading the pack, followed by me & a couple of oldtime bushpaddlers (Frank Fernandez & Jose Rosado) and the hardcores of the hardcores, Tony's crew (JT & Jorge & who else is behind them sails? ), bringing up the rear, on our 2nd excellent adventure in the Taylor, though Terry & Keith's 1st! Terry is trying to add a permanent memorial to Keith on this, his site, but we're having issues with the hosts. In the meantime, this is a very fitting tribute! Hopefully, we will get it resolved soon. In the meantime, the Flexican comes through as usual! Still have a few seats left at the table for Keith at the Biscayne 50th anniversary this Saturday. Would love to have a good turnout, you can contact Jessica at jessica@southfloridaparks.org to sign up. I don 't check in with this site as often as I should (great site). Keith was always a wealth of knowledge, sorry to hear that he passed.